DRWF has been a strong force in getting the awareness and preparedness message across to the diabetes community by offering a Diabetes Identification. Currently, DRWF is the only resource that provides the identification for FREE by request. Our mission is to promote and educate the public about proper identification for those with diabetes. This identification is key when you are unable to speak for yourself in an emergency. 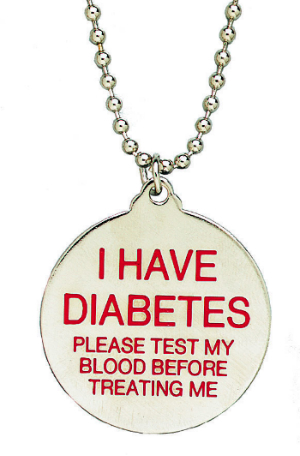 You can request the FREE Diabetes necklace -with a self-addressed and stamped envelope sent to DRWF or you can order online. By wearing this life saving ID each day, you are in effect educating and sharing your knowledge of diabetes. Since announcing the Diabetes Necklace program in 1993, DRWF has experienced an overwhelming response. DRWF is proud to offer a product that everyone can use in an emergency situation, and hopefully this will prevent accidents in the future. So spread the word to your diabetes community. To receive your FREE Diabetes Necklace, click here to fill out the Diabetes Necklace Coupon and mail your self-addressed, stamped ($0.69) request to the address below. If you have any questions about our necklace program please email us. If you are a health care professional and would like information on how to receive a supply of necklaces for distribution to patients please send your request via email All correspondence will be handled via email only.